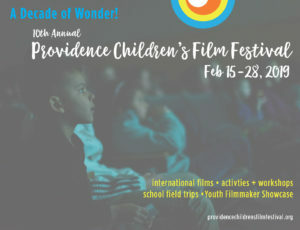 Providence Children’s Film Festival brings the world to our children and our community through important films made from extraordinary, often unrecognized filmmakers from all over the globe. Thoughtfully-curated films paired with post-film discussions and activities are designed to deepen our understanding of a film’s themes, inspire family conversations and increase our capacity for empathy. With support from outstanding community and state businesses and organizations, we are able to enthrall young audiences with the magic of visual storytelling and nurture young filmmakers as they explore their craft. Looking for a unique way to get your business or organization in front of thousands of engaged family attendees? Sponsor PCFF’s 10th Anniversary Festival, February 15-28, 2019! View the 2019 Festival (A Decade of Wonder!) Sponsor Deck. Click here for list of current Festival Partners. School Partners receive discounts on in-school screenings! Learn how your organization or school can help inspire a new generation of thinkers and doers through the art of the moving image. Contact Alyssa Biolchini, Operations Manager, to learn more about sponsoring the 2019 PCFF Festival. PCFF Film Hub, a collection of online resources designed to increase access to the best of independent and international children’s cinema, and foster film education throughout our community in schools, homes and public spaces. Contact Alyssa Biolchini, Operations Manager, to discuss ways your organization can support PCFF.